We are back with this week’s best of beacons post. In this feature, we will cover some interesting news and updates, right from how Taipei Fine Arts Museum leveraged beacons to enable easy navigation to an interesting post on how beacons are fast reshaping retail marketing strategies. So, sit back and check out the latest stories from the beacon world. Taipei Fine Arts Museum (TFAM) recently launched its beacon-enabled app to guide the museum visitors through the galleries. After studying audience behavior at the museum, the team at the museum found that visitors do not usually walk through the exhibitions in the order planned by the museum, but instead wander around randomly in the exhibition space. With the help of the beacon-enabled app, the museum plans to let the beacon devices recommend what piece the visitor should see next based on his or her location. So, in a way the museum provides a preset route for the visitors, but users can alter the direction of the route based on their behavior. Read this article to know more about TFAM’s beacon-enabled app. 85% of the US consumers like to shop in stores because they want to touch and feel items before buying them. Thus, brick-and-mortar retailers are trying to focus on designing a strategy that aligns well with both consumers’ needs and business goals. One of the biggest parts of the strategy building program for brick-and-mortar stores involves adapting in-store trends to revamp the entire shopping journey of a consumer, right from deploying latest technologies to reshaping retail marketing strategies. This blog post brings to you a list of five in-store trends that are reshaping brick-and-mortar stores and bringing more value to shopping experience. 3. 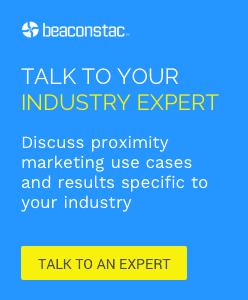 Beacon Roundup: What percentage of Americans leave Bluetooth on, anyway? Eddystone with its recent updates – announcement of Chrome browser support on Android and a new secure beacon format called Eddystone-EID – is fast shaping 2016 as the year of the beacon. Now while Eddystone solves one of the primary barriers to beacon adoption which is the need for a beacon-enabled app, it still leaves another question unanswered – ‘how many users will keep turn their Bluetooth on?’ This question is very crucial since one cannot interact with beacons without turning Bluetooth on. Read the blog to get answers to such questions and more about Physical Web. What percentage of Americans leave Bluetooth on? The New Zealand Transport Agency has recently deployed about 60 roadside beacons on the heavily-used tourist routes like the one from Christchurch to Queenstown. These roadside beacons detect the smartphone app in the passing vehicles and communicate with them. Once detected, a computer voice warns the drivers of hazards ahead, including accidents or changing conditions. The beacon-enabled mobile app also informs the drivers about estimated time to reach the destination and good places to make a stop en-route. To learn more about this beacon-enabled mobile app launched in New Zealand, read this post. Turkcell, the leading mobile phone operator of Turkey, and the Municipality of Turkey’s Gaziantep, have joined forces to transform Gaziantep into a ‘smart city’. And their latest project is aimed to facilitate the lives of visually-disabled individuals via a beacon-enabled app. Turkcell and the Young Guru Academy (YGA) have developed a mobile application and service called “My Dream Companion” which includes a beacon-powered transportation feature. This feature allows visually-disabled individuals to use the buses on the city’s public transportation system, access route, get bus stop information, receive location alerts and more. Check out this post to know more about the features of this beacon- enabled app designed in Turkey.